Psychology is of interest to academics from many fields, as well as to the thousands of academic and clinical psychologists and general public who can't help but be interested in learning more about why humans think and behave as they do. 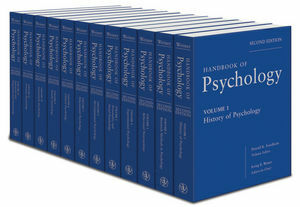 This award-winning twelve-volume reference covers every aspect of the ever-fascinating discipline of psychology and represents the most current knowledge in the field. This ten-year revision now covers discoveries based in neuroscience, clinical psychology's new interest in evidence-based practice and mindfulness, and new findings in social, developmental, and forensic psychology. Irving B. Weiner, Ph.D., is Clinical Professor of Psychiatry and Behavioral Medicine at the University of South Florida and former Director of Psychological Services at the University of South Florida Psychiatry Center in Tampa, Florida. He is a Fellow of the American Psychological Association and of the Association for Psychological Science, a Diplomat of the American Board of Professional Psychology in both Clinical and Forensic Psychology, and a Licensed Psychologist in the State of Florida. He is currently President of APA Division 5 (Evaluation, Measurement, and Statistics) and Past President of APA Division 12 (Society of Clinical Psychology), formerly president of the Society for Personality Assessment and of the International Rorschach Society, and a recipient of the Society for Personality Assessment Distinguished Contribution Award. 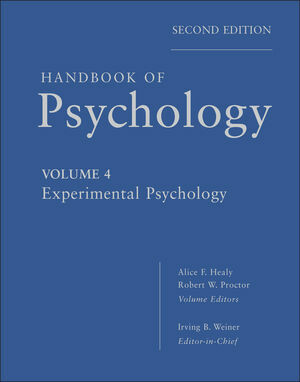 He has authored or edited over 15 scholarly and professional books including the first edition of the Handbook of Psychology and, with W. Edward Craighead, the fourth edition of the Corsini Encyclopedia of Psychology.